Live music at the ceremony is the most under-considered part of planning a wedding. It transforms the most touching moments of the day from special, to beautiful beyond words. Subtle, perfectly performed songs and pieces are how The Bombastics musicians turn your day into something better than you ever imagined. Explore the options below, listen to our samples and get in touch for a quote. We have excellent offers when you combine our reception band with ceremony music. You’ll be pleasantly surprised at the price. Live Music. The Ceremony Saviour. Picture the bride and her bridesmaids walking down the aisle. Imagine no music playing during that moment… Awkward! Now imagine hearing beautiful music, the original recording of a song chosen by the bride and groom… then it finishes… And the bride is halfway to the altar. Awkward again! Live music fixes this disaster. After hundreds of ceremonies we know the value of an extended intro, an extra chorus, or the ever-useful interlude. Our live performances have saved many brides and their guests from a less-than-perfect moment. Don’t settle for less-than-perfect. Choose perfect. Choose The Bombastics for your wedding ceremony. Having acoustic guitar and vocals (usually male) is a great way to set a relaxed tone for your wedding ceremony. We can perform almost any song in an acoustic style, rearranged for the given moment. You’ve also got the option to add other instruments like a female vocalist, percussion, piano, even saxophone. Chat to us about your goals for the vibe of the ceremony and we’ll be able to put together a combo that suits perfectly. 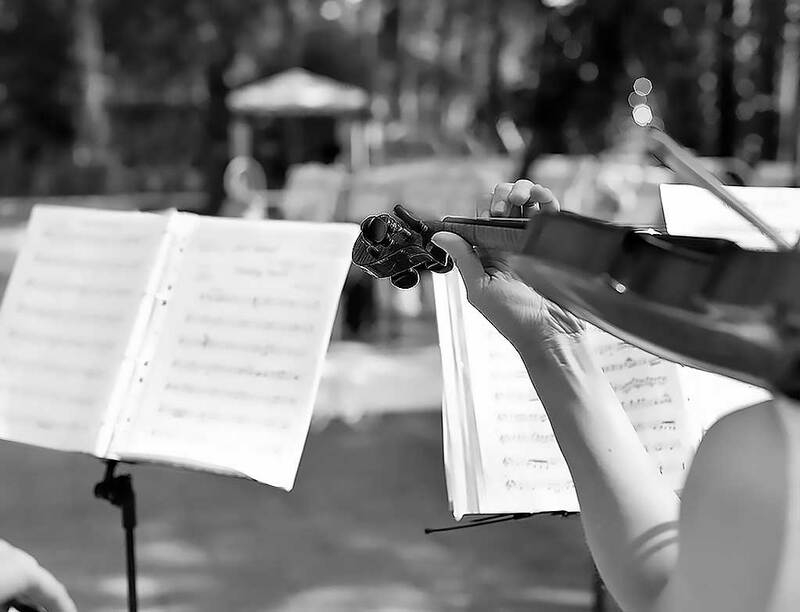 If you’re looking for a little formality in your wedding ceremony, classical music can bring this in a subtle way. A string quartet or a classical pianist are perfect instruments to perform classical pieces or even classical arrangements of pop songs at ceremonies. Because there’s no vocalist, using traditional or religious songs remains subtle but formal, and classical style pop songs don’t seem inappropriate. If this sounds like you, let us help put together the right ensemble and the right pieces to shape your wedding ceremony. Getting married in a church? Consider whether sacred music is appropriate (Ave Maria, hymns etc). Or instead have classical music like Pachelbel’s Canon in D and other traditional favourites without the religious aspect. This could be performed by a string quartet or even a classical pianist. Remember to check with the priest or celebrant about what types of live music are allowed. Getting hitched by the beach? Perhaps consider an acoustic vibe. Acoustic guitar, smooth vocals and some catchy percussion to set a relaxed tone for the day. Remember during the ceremony the guests are almost always silent. People are going to hear every word out of the singer’s mouth. The song might mean a lot to you, but could it be slightly off-topic or completely inappropriate. Just watch the Hangover 2! Remember that ceremony music has a practical purpose. The processional piece must be at a tempo the bride and bridesmaids can walk comfortably to. And in a wedding dress! Too fast and you risk tripping. Too slow and it takes a little too long. For the recessional song, make sure it’s uplifting so people feel they can applaud and cheer. Again, too downbeat and guests won’t know what’s appropriate.